Wafaa Bilal's "Bar at the Folies Bergère (after Manet)" in the Milwaukee Art Museum's Impressionism gallery. Image from the artist's website http://www.wafaabilal.com. I love that the Milwaukee Art Museum doesn’t shy away from controversial contemporary artists. You might remember a work in the Museum’s Collection Galleries by Wafaa Bilal and Shawn Lawson that was temporarily installed in the Museum’s Impressionism Gallery in 2007: the Bar at the Folies Bergère (after Manet). 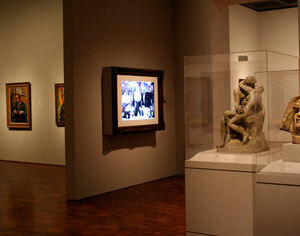 Here is the Museum’s 2007 press release “Viewers Enter a Masterpiece in New Installation”. You can see photographs and a video of the Bilal piece on the artist’s website. In the latest news, Mr. Bilal is now on to a new project that involves having a video camera surgically implanted into the back of his head! You can read about it in the NYTimes.com ArtsBeat blog here and here in The Art Law Blog post. This entry was posted in Art, Art News and tagged Collection, Contemporary Art, Impressionism, News, Wafaa Bilal. Bookmark the permalink.